The Brush turkey is found on the east coast of Australia living in rainforest, wet open forest, and some dry inland areas. They are part of the Megapode family, being mound builders. It is an interesting bird, scratching leaf matter and soil together creating a huge mound, measuring up to 4 meters across and 1meter high. The female will lay her eggs in tiers in a deep hole in the mound's top. 15-24 eggs are laid in spring. The heat generated by the decomposing leaf matter, combined with the sun’s heat incubates the eggs at about 33-35 degrees. The temperature is tested by the bird sticking its beak in to the mound, and material is either added or removed to achieve the right temperature. Interesting to note the males do all the work of nest building and tending the eggs, the female just lays the eggs and leave the rest to the male. When the eggs hatch the fully feathered chicks dig their own way out, and are independent of the parents from the very start of their life. 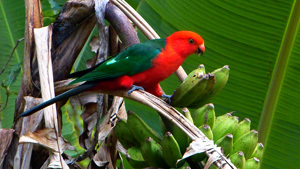 They feed on fruit, seeds and insects. Predators include Goannas, Python snakes, carnivorous marsupials, introduced pigs and foxes, and unfortunately humans and our domestic pets. 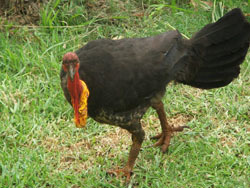 The Brush turkey is mainly a ground bird, but roosts in trees at night, and can in fact fly quite well when it has to. When white man first arrived in Australia it was thought that these mounds were man made, but after consultation with the Aboriginal people early settlers were finally convinced that it was a bird nest. I personally find it amazing when walking in the bush to come across a totally cleared area, not a single leaf left, and somewhere is another nest being built, or added to. Spring is breeding time for our local Brush turkeys, so you may have the pleasure of seeing the newly hatched chicks in your garden. Please remember they are independent, and quite able to fend for them selves, so just watch and enjoy.